You can watch endless documentaries, read countless books, and still some realities don't set in until you witness them first hand. 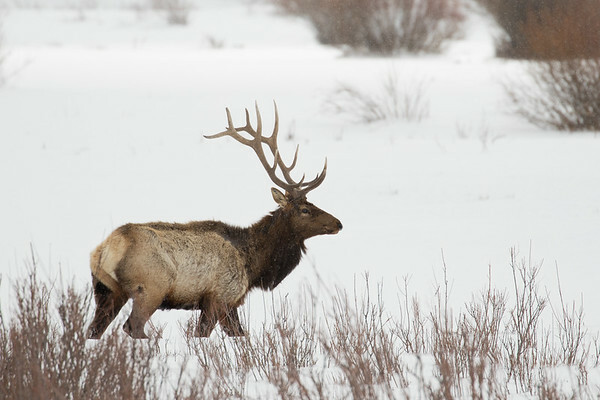 This weekend I experienced one of those realities, by witnessing the life, and death, of a bull elk in Lamar Valley. On a crisp, cool Friday morning we were traveling along the Northeastern part of the valley when we spotted a healthy bull elk resting among the willows near Soda Butte Creek. The wind was whipping snow across the valley, creating a blizzard-esque effect across the landscape; at times the bull elk was nothing more than a large pair of antlers appearing like an apparition amidst the flurry. Eventually the wind subsided, and we were able to observe the bull in all his resting glory; eating nearby vegetation and serving as a perch for an adventurous magpie. We watched the bull for probably fifteen to twenty minutes before moving on to try and find other subjects to photograph, not knowing that this was the last time we would see him alive. Throughout the rest of the day we didn't see much; the three most commonly seen wolf packs in the area were bedded down almost all day, and most other wildlife had made themselves scarce during the inclement weather. We decided to call it an early day, get back to town for dinner, and then hit the hay early so we could be up for sunrise the following day. It turns out this elk was apparently unhealthy, and the magpie perched on it was actually pecking at it in an attempt to feed on the elk while it was still alive. Anyways, there we were with an elk that was successfully hunted and killed by a pack of three wolves but is too close to the road for them to eat. It also poses a problem for other scavengers such as foxes and coyotes, as it brings them too close to the road for their own safety. 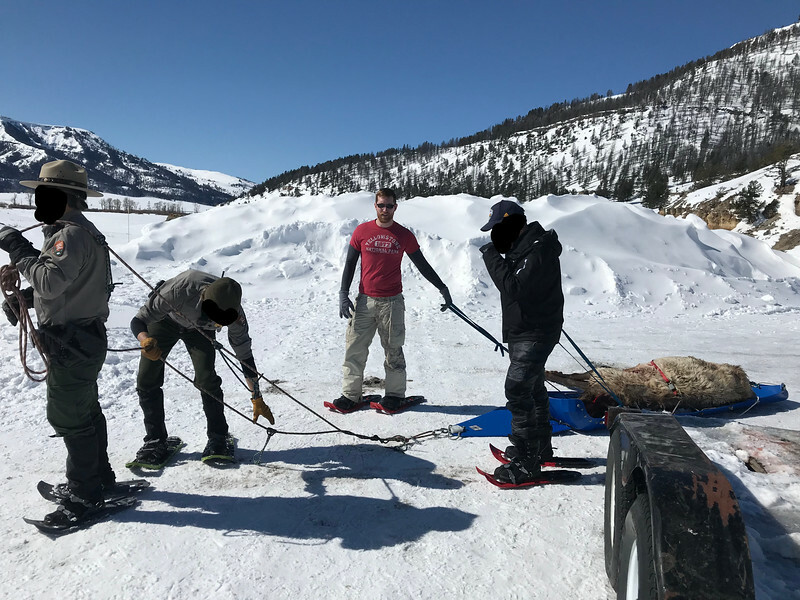 Two rangers along with a few volunteers pulled the elk from the river and onto a sled, from there it was hauled a ways up the road. We followed the rangers to the Lamar River Valley Trailhead, where they were planning on leaving the carcass. After parking the car we walked up to chat with the rangers and other volunteers to figure out what happened to the elk, and this is when I saw the opportunity to give back a small part of what the park has given me. 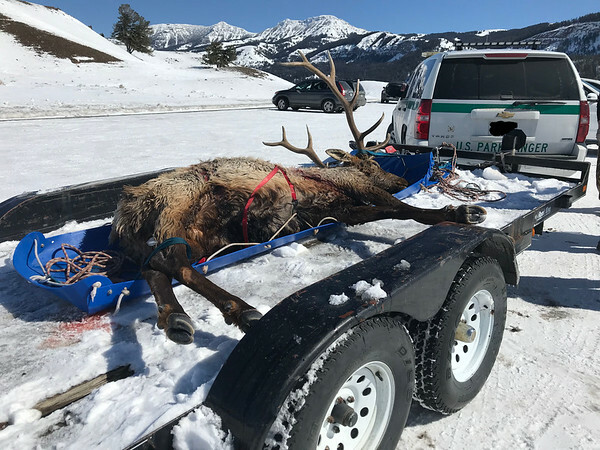 I volunteered to help the rangers relocate the elk carcass since most people were moving on, and under guide of one of the lead wolf biologists in the park we moved the carcass about 150 feet out into the valley. The rangers kept the elk's head, both for the purpose of testing for disease and also to ensure no one ventured out to carry off the elk's antlers. Over the course of the next two days a multitude of wildlife watchers, photographers, and general park goers staked out the carcass in a hope to see the Lamar Canyon pack come claim what was rightfully theirs, but alas they didn't make any appearance during the day. It was an incredibly memorable experience and I was more than enthused to help the rangers, but it certainly helped drive home the harsh reality of a Yellowstone Winter. It seems the blink of an eye is all it takes to differentiate life and death, and that too is something I shan't forget.